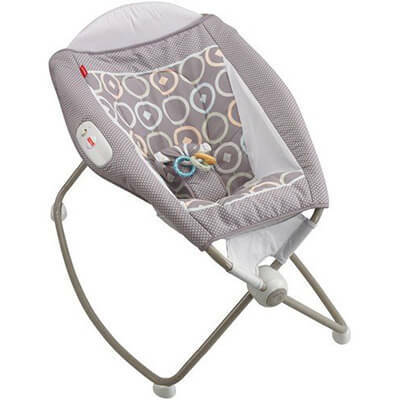 Thinking about purchasing the Fisher-Price Newborn Rock n’ Play Sleeper for that new addition to your family? Yet, aren’t quite sure if it’s the exact baby bouncer that you’re looking for? If so, to assist you in making a decision about whether or not it is the one that you’re looking for, here is a comprehensive product review on this baby equipment selection. This bouncer – sleeper is considered to be one of the more deluxe, posh options that are currently available when it comes to the baby gear that you can get. An extra-deep seating/lying area with mesh sides that sits at an incline, which is covered in soft washable fabrics. Baby padding inserts highlighted by a deluxe bunny headrest. The ability to gently rock back and forth with a simple push. The option to turn on and off soothing vibrations. A sturdy, lightweight metal frame that is compact and foldable. Age-appropriate ring and clacker toys made from durable, safe plastic. Due to the fact that the Fisher-Price Newborn Rock n’ Play Sleeper has a long list of features, it equally has a long list of benefits that come from using it. Providing an infant with a comfy, cozy place to both rest and play thanks to the soft padding and inclined seat. Plus, that rest area is safe since the padded inserts, headrest, and harness keeps a little one nice and secure. Offers parents a way to calm, sooth, and settle down their child courtesy of its gentle rocking motion and delicate vibrations. Easy to set up and take down courtesy of its compact, foldable frame. Also, easy to transport from place to place and store. Convenient to clean with its machine washable fabrics. Included toys keep a child occupied and also teach them hand/eye coordination. In order to really give you insight on whether or not this Fisher-Price sleeper is the one that you want to get, we decided that it would be a good idea to give you the opinions of actual parents who have used it. We found these opinions by scouring the Internet, searching parent sites, forums, baby gear sites, and other places where moms and dads shared their thoughts and feelings about parenting, baby products, and the like. There were a lot of comments about how it was very easy to set-up and that the portability of the sleeper allowed parents to take it with them if they needed to use it outside of the house. One thing that parents liked was how it could be used as a sleeper and a place for their child to play. So, it served two different purposes, making it more affordable. Parents enjoyed the look of the sleeper, especially those parents who had girls. Some parents didn’t like how it wasn’t self-powered and required pushing. Some parents thought that the padding wasn’t as soft as it could be. Others didn’t like how deep the sleeper was and pointed out that their little ones sometimes struggled to get comfortable. When buying anything, you need to be intelligent about what you’re doing so you don’t end up super unhappy with your purchase. So, to help you be an intelligent buyer. Always shop around. It’s never a good idea to just purchase the first thing that you see because you could find it at a better price somewhere else. Do some investigating before you buy something to ensure that it’s a quality product. Ask others about what they think about what you’re buying to see if it’s a good thing to buy. Don’t purchase anything when you’re in a bad mood or in a rush due to the fact that there is a very good chance that later on, you’ll be completely unhappy with it. 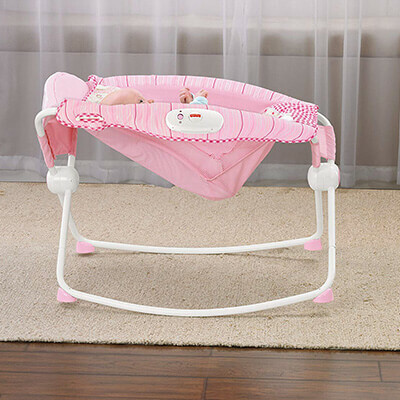 From reading this comprehensive baby bouncer review, you should now have all the information that you need to make a choice about whether or not the Fisher-Price Newborn Rock n’ Play Sleeper is the one that you’re looking for. If it is, then the next thing to do is to start shopping for it online. When you find it for a great price without having to go to a crowded, walk-in baby store, you’ll be super happy that you did. If you have any questions feel free to ask Eva Baby Gear team in comments below.